West Penn hospital held two community meetings in October about the West Penn Hospital Master Plan. The first on October 10th and the second on October 16th. After the second meeting it was decided that a third community meeting would be held at a later date. When West Penn Hospital chooses a date for their third meeting, Bloomfield Development Corporation will share that information with community members. To view the presentation in its current form click here. On Monday, February 19, at 6:30 pm, 33 residents gathered to view the design proposed by the developer, M.P. Kratsas, of a new Hampton Inn at 4520 Penn Avenue. Community concerns included the impact of the construction on neighboring residences, pedestrian safety, and traffic, as well as the materials and lighting to be used in the new building. Bloomfield Development Corporation will draft these concerns in a letter to the City’s Contextual Design Advisory Panel (CDAP) before the developer’s design review hearing. 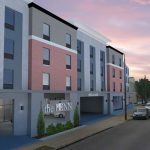 A new 115-room Hampton Inn hotel is being built at 4520 Penn Avenue. The development team of M.P. Kratsas is appearing before the City’s Contextual Design Advisory Panel (CDAP), which has requested the community’s comments prior to the CDAP review. Bloomfield Development Corporation will not provide comment to CDAP on the design without first hearing from the community, and the developer agreed during the zoning process that a community meeting on the design would be a priority. On Monday, January, 29 at 6:30 PM, roughly 400 people (365 sign-ins) packed into the auditorium of the West Penn Hospital Nursing School to learn about the proposed development at 4401 Liberty Ave and to express their concerns. Having a grocery store and affordability on the site were top community priorities, but attendees also voiced concerns about the proposed development’s design and its impact on issues such as parking and traffic. A new building with approximately 220 market-rate rental units and 20,000 sq. ft. of first floor retail is being proposed for development at 4401 Liberty Avenue. The parcel to be redeveloped currently holds the Shursave IGA grocery store, Veterans of Foreign Wars building, and one vacant residence, as well as a large parking lot and double billboard. The plot is bordered by Liberty Ave, Howley St, Gangwish St, and Ella St.